Brisbane Convention & Exhibition Centre (BCEC) has taken out the industry’s top accolade for venues, winning the Meeting, Exhibition or Event Venue – Capacity more than 500 at the Meetings & Events Australia (MEA) National Awards. The Centre was also awarded a ‘Highly Commended’ in the Banqueting & Catering category. The awards ceremony took place last night at the Convention Centre as part of Meetings & Events Australia’s (MEA) Evolve 2019 National Conference in front of 500 Business Events industry leaders from around the country. 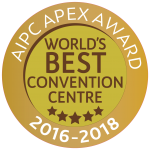 BCEC General Manager, Bob O’Keeffe said the Centre was extremely proud to have won the award against such strong competition from fellow convention centres and venues around Australia. Bob O’Keeffe paid tribute to the Centre’s ‘passionate and professional team’ from both front and back of house, who are responsible for the day to day operation of delivering over 1,100 events a year to the Centre’s many valued clients. He described the award as a great result which comes at a time when the Centre is on track for its best year ever, surpassing the success of the 2014/2015 G20 year. The Centre has just finished a record quarter as well as an extremely busy month in March hosting 121 events including 16 conferences and more than 85,000 visitors through the door.